Researchers conducting a 5-year-long study examining snow cover in a northern hardwood forest region found that projected changes in climate could lead to a 95 percent reduction of deep-insulating snowpack in forest areas across the northeastern United States by the end of the 21st century. The loss of snowpack would likely result in a steep reduction of forests' ability to store climate-changing carbon dioxide and filter pollutants from the air and water. The new findings, out today in Global Change Biology, highlight a growing understanding of the broad impact of climate change across seasons on forest ecosystems, according to scientists who leveraged six decades of data showing declining winter snowpack at Hubbard Brook's forest. The 7,800-acre research forest in New Hampshire is heavily populated by sugar maple and yellow birch trees, and has been used for over 60 years to study changes in northern hardwood forests—an ecosystem covering over 54 million acres and stretching from Minnesota to southeastern Canada. "We know global warming is causing the winter snowpack to develop later and melt earlier," said the paper's first author Andrew Reinmann, an assistant professor and researcher with the Environmental Science Initiative at the Advanced Science Research Center (ASRC) at The Graduate Center, CUNY, and with Hunter College's Department of Geography. "Our study advances our understanding of the long-term effects of this trend on northern hardwood forests—which are critical to North America's environmental health and several industries. 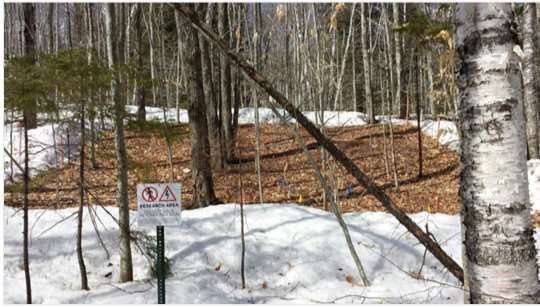 The experiments we conducted suggest snowpack declines result in more severe soil freezing that damages and kills tree roots, increases losses of nutrients from the forest and significantly reduces growth of the iconic sugar maple trees." The researchers' 5-year-long experiment consisted of removing snowpack from designated plots during the first 4-6 weeks of winter each year between 2008 and 2012, and then comparing the resulting condition of the soil and trees (all sugar maples) in those plots to the soil and trees in adjacent plots with natural snowpack. Their analysis found that soil frost depth reached over 30 centimeters in areas where snow cover had been removed compared to roughly 5 centimeters at control plots. The severe frost caused damage to tree roots that triggered a cascade of responses, including reduced nutrient uptake by trees, shorter branch growth, loss of nitrogen from soils into nearby waterways, and decreases in soil insect diversity and abundance. Scientists collected sample cores from sugar maple trees on their research plots and measured the width of the cores' rings to reconstruct growth rates. They found that growth declined by more than 40 percent in response to snow removal and increased soil freezing. The trees also were unable to rebound even after snowpack removal ceased. "These experiments demonstrate the significant impact that changes in winter climate have on a variety of environmental factors, including forest growth, carbon sequestration, soil nutrients and air and water quality," Reinmann said. "Left unabated, these changes in climate could have a detrimental impact on the forests of the region and the livelihoods of the people who rely on them for recreation and industries such as tourism, skiing, snowmobiling, timber and maple syrup production." The heat that snow-cover reflects back into the space will be absorbed by the land, thus, increasing land surface temperature. That is a concern too. So basically, less water means smaller plants, and less snowpack means a warmer surface, meaning a less snowpack (rinse and repeat until the exponential decay leads to no-snow at all). Less water means drier conditions and increased potential for wildfires.